Recent trends point to increasing competition for gifts. In the state of Virginia, the number of not for profits has increased by an annual average growth rate of 3.6% since 2000. This growth rate is nine times faster than the for profit sector during the same time period (Nonprofit Economic Data Bulletin Number 41, November 2012). Since 1972 when total annual giving was first recorded, the amount of gifts made across the United States has grown from under $150 billion to $336 billion in 2013. When compared to the GDP, however, this growth in dollars does not translate to an increasing share of the proverbial economic pie: giving hovers at 2% of GDP, ranging from a low of 1.7% in 1976 to a high of 2.3% in2001 and back to 2.0% in 2012 (Giving USA). This trend along with changing demographics across the United States indicates that a different fundraising environment is arriving. Observed trends include focus on results and impact, corporations' increasing use of philanthropy as a tool for achieving specific business goals. Local conversations regarding not for profit sustainability encourage not for profits to look for earned income outside of gifts and government contracts. Regardless of our success in searching for Our collective search for income that doesn't include philanthropic gifts notwithstanding, the pressure on professional fundraisers will continue to increase. Yet it's not inaccurate to say that the foundation for professional fundraising is not as strong as it needs to be. Turnover in development offices is so prevalent that all professionals have heard the joke: "How long does it take for a good fundraiser to find a new job? Lunch." The 2013 study "Underdeveloped" tackles the turnover problem head on. This research marks a watershed moment in our profession as evidenced by the number of times the study has been referenced in meetings, educational settings, and casual conversation. Helpfully, this study points to a strong culture of philanthropy in all areas of an organization as the foundation for fundraising success (Bell & Cornelius, 2013). While a diverse income stream is important for all businesses, gifts are the only stream of income for which not for profits do not have to compete with the resources of the for profit world. It's also an area of untapped potential: an increase in giving from 2.0% to 3.0% of GDP would increase giving by $370 million in the Metro Richmond area alone (The Chronicle of Philanthropy, How America Gives, 2013). Even looking at these trends with clear eyes, professional fundraisers continue to believe that philanthropy is a critical part of American culture and a source for increased revenue. Beyond the resources that gifts provide for the execution of mission work, philanthropy reinforces important community values. AFP's mission is: TO ADVANCE PHILANTHROPY by enabling people to practice effective and ethical fundraising. Over the last 20 years, our central tactic to meet our mission has been in the area of direct education of and networking opportunities for fundraising professionals. Each year membership is level or shrinks slightly; monthly meeting attendance is erratic. These facts have caused us to rethink our approach to meeting our mission. In the Central Virginia region, and particularly in Richmond, we have a number of organizations that provide educational opportunities for fundraising professionals: VAFRE, University of Richmond's Institute on Philanthropy, NonProfit Learning Point, in addition to task specific organizations such as the Planned Giving Council. These realities require us to ask: is AFP Central Virginia a relevant organization? The research we've done indicates that our mission to advance philanthropy is more relevant than ever; trends confirm there is work to do. National Philanthropy Day especially stands out as a meaningful expression of our work. It is time, however, to reimagine how we implement our mission. Instead of continuing to duplicate or compete for educational space in the region, AFP Central Virginia will turn our attention to a new aspect of advancing philanthropy. 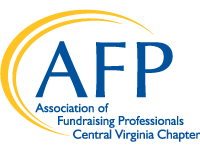 AFP Central Virginia's mission is to advance philanthropy by enabling people to practice effective and ethical fundraising. Our focus will be specifically to nurture both professionals and, specifically, the profession of fundraising. Our goal is to engage our membership in meaningful work, dialogue, and learning opportunities that raise the profile of the profession in Central Virginia. Our work will increase our community's understanding of and respect of our profession, resulting in slowing professional turnover rates and an increase in dollars and donors region-wide. Our strategic plan is ambitious, represents significant change in the way we work as aprofessional association, and will take time to unfold. We will request and encourage meaningful philanthropic support from our membership and others as appropriate, being careful to provide our donors with an excellent giving experience. A.) Potential donors will be asked in person for a specific gift to accomplish a purpose. B.) Donors will understand how their gift made a difference. C.) Donors will receive occasional updates on AFP Central Virginia's progress towards goals. D.) Donors will be included in planning. Advocate for Philanthropy as a Regional Value. We will advocate for philanthropy as a value and way of life in our region. A.) We will inform ourselves about laws, policies, and trends (locally and nationally) that impact philanthropy and encourage action as appropriate. B.) We will encourage a culture where donors are valued as an integral part of the mission of nonprofit organizations. C.) We will lend our name and our volunteer efforts to organizations and activities who share our goals. Celebrate Joyful & Ethical Fundraising. We will celebrate (and teach) joyful and ethical fundraising in our region, nation, and world. A.) We will promote the Donor Bill of Rights and ethical fundraising practices adopted by AFP. B.) We will educate non-fundraising professionals about ethical practices in fundraising. C.) We will use National Philanthropy Day and other events to celebrate the practice of ethical and joyful fundraising. D.) We will work with other organizations in our region to accomplish this strategy. Our members will grow in their dedication to fundraising as a profession and as a method for achieving good in our world. A.) We will support career planning and progression across disciplines and stages. B.) We will increase our diversity. C.) Professional training efforts will focus on partnerships with educational bodies in our region to continue to improve offerings. D.) We will promote connectivity to amongst ourselves seeking to act as a team to improve our region and also as advocates for our own organization.